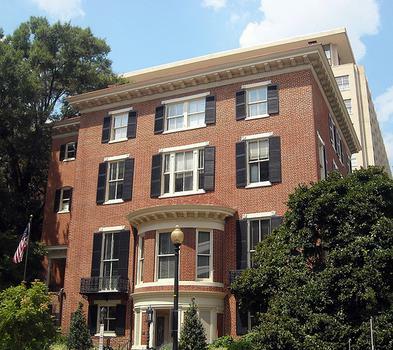 The Ringgold-Carroll House was built in 1825 for Tench Ringgold, who was part of a three-member team in charge of restoring public buildings in the District of Columbia, following the War of 1812. The Ringgold-Carroll House was built in 1825 for Tench Ringgold, who was part of a three-member team in charge of restoring public buildings in the District of Columbia, following the War of 1812. From 1832-1833, Chief Justice John Marshall resided with Ringgold in the house. In 1835, the house was sold, and a number of prominent people have since lived in the house, including William Thomas Carroll, a clerk at the Supreme Court, Chief Justice Melville Fuller, Senator Joseph Medill McCormick, and Congressman Robert Low Bacon. The Diplomatic and Consular Officers Retired (DACOR) now occupy the house, which is not open to the public except for special events.